For decades Oakland Township had benefited from good leadership and governance. Those leaders, using our Township’s governance structure, created an exceptional community where attractive neighborhoods harmonize with carefully preserved natural beauty. 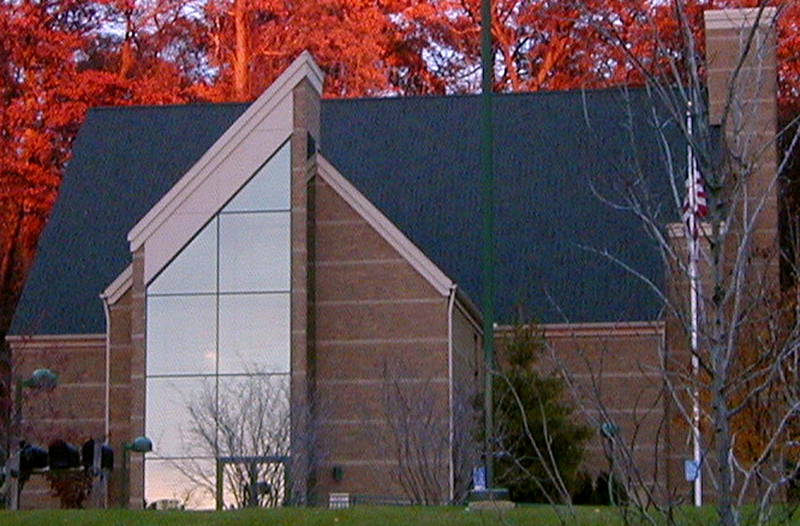 In 2012, a new Township Board was elected. Under the leadership of Terry Gonser, they initially took aim at our ordinances, development controls, environmental protections, our parks, trails and township staff. In 2013 this website was created in an attempt at informing our citizens about what was occurring in our Township. Our hope was to influence the actions of our Township Board. Between 2013 and 2016, the Board has changed the direction Supervisor Gonser was taking our Township. The Board repeatedly rejected his attempts at changing our governance structure to one where he would be a full time Supervisor. At the August 2, 2016 primary election, the Township residents chose a new candidate for Supervisor, former Trustee Michael Bailey. They also chose another new trustee candidate, Lana Mangiapani. Those candidates, along with 5 other returning officers and trustees were officially elected in the November 2016 general election. We trust the new Board will return to the good governance and leadership methods we had for years. However, this website will continue to make visible important topics and potential issues that warrant resident attention. Please visit often or ‘Join the Watch’ by clicking the ‘follow’ link in the lower right side of this page. Please share this website with your neighbors so the residents of Oakland Township understand what is happening in (and to) our beautiful Township. I can’t locate the author or authors of any of the entries in this “blog”. Can you add this information in the future? I contribute posts and pages to this website. My goal is to inform Oakland Township residents about their government. I feel that I can offer a perspective gained from over 20 years of service to the township. I have served on the Board of Review, the Building Authority, the Zoning Board of Appeals, the Safety Paths and Trails Committee, the Planning Commission and the Board of Trustees I have served under four different Township Supervisors and I feel that our current Supervisor is handling his office very differently than his predecessors. Change can be good or bad but it should not go unnoticed. I am glad to see that you are taking an active interest in our government. I applaud those who have set up this website. And I am particularly grateful that Township Board meetings are now videotaped. Watching these meetings does more to expose weaknesses in governmental leadership than all the political back and forth bickering that comes from the spinmeisters. I have lived in the township for 20 years. The excellent parks, the bikeways and trails and natural beauty of this community have made Oakland Township a truly unique and wonderful place to live. In the past, development at the cost of the environment has been held in check. But now I worry for my township. To watch the shameless power grab that the township supervisor launched against our Parks Department has made me ashamed. In full disclosure, I should note that I was a member of the Citizens Advisory group that helped with a master plan for the bike routes. But that is as political as I have ever been. Yet that experience demonstrated to me the professionalism and the excellence of the Parks Department in developing, maintaining and protecting our system of parks and trailways. But then I saw Supervisor Gonser singlehandledly stop the Adams Road bikeway extension with no real opposition by the board. I have noticed with alarm the refusal of most of the board members to sign a very sensible ethics document. And then there is the Supervisor Gonser’s Glenn Beck-shared paranoia over the UN’s alleged Agenda 21 “global conspiracy.” To think that our highest elected township official holds such illogical views explains much about the supervisor’s war against our Parks department, to the embarrassment of every Oakland Township citizen. I will be following this website carefully. In watching the meeting videos, it seems clear to me that the new leadership of our board is changing the direction of our township, jeopardizing the natural attractions that have made this such a wonderful place to live and giving special treatment to large landowners whose interests in Oakland Township are financial instead of environmental. In the future, I would like to see a breakdown of all the campaign donations each board official has and is receiving, a public accounting of all travel and township-paid expenses by elected officials and department heads and a full vetting of all the business, family and professional associations held by township officials. Perhaps that will help explain what is happening to Oakland Township. Jim, in response to Mike Wendlends comments, I am also 30 resident of the township, and at one time, my kids use to ride there horses from our prior home to the Goddison store and hitch them up to the rail, while the got a coke. Oakland township is our home, and we like it as it is. Close to whatever style of living you enjoy, but “country”, when you want. So, I normally do not get to excited about the political arena, except that I knew most of the board and supervisors in the past and they did a good job of understanding how it works. It appears to me that the current Supervisor has a sort of “Obamafixation”, and does not know how to judge the value of community input or comprimise. Sort of a “my way or the highway” attitute. That is not the spirit that we need. He needs to understand the need to be a governing leader and not a dictator. Maybe we need to expand your sphere of knowledge support, in order review the efforts and the adherence to the rules of order. I cannot help but notice that Mr and Mrs Markel have become the new serial Gadflies and when either one stands up at any Oakland Township meeting, we all collectively groan and wince at their terrible, often pathetic ” We know everthing ” remarks. Someone should tell them in a nice way to get a hobby or to move to another community maybe in the U P.
Please note that the website you typed is incorrect. It is http://www.saveoaklandtwp.org. As a member of the Planning Commission for 26 years, and a chair for a number of them, the residents need to recognize that they need to FULLY understand the situation before they attack the Planning Commission. Believe me, they ARE looking out for your best interests within the confines of our Township Ordinances. Please do not leave your political propaganda on my mailbox in the future. Oakland Valley subdivision. Other residents in your subdivision were glad to receive the information. Some people may think the information is propaganda, especially those who support Terry Gonser, Anne Marie Rogers, Roger Schmidt and, your neighbor, Beth Markel. 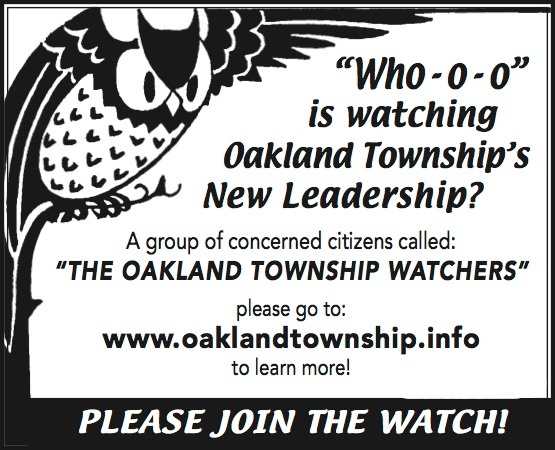 However, if you have visited this website, or the ‘Oakland Township Watcher’ Facebook page, you will quickly learn that all the information on the flier is factual. We are only trying to provide facts so the voters can make an informed FACTUAL decision when they vote on August 2nd. I am responding to your above note. My name is Richard Michalski. I, along with several others in our Township, initiated this website to make visible some of the things that our newly elected leadership is doing. As you know, I served as an Oakland Township Planning Commission Member for 26 years until 2008. For a number of years I served as the Chair of the Planning Commission. The purpose of this website is to share with the community facts on actions our Board is taking. The majority of the material included is either from documents obtained through a Freedom of Information request, Board meeting minutes or videos of Board meetings. Hopefully, this information will allow residents to “connect the dots” and form their own opinion as to whether they agree with the Board’s actions. Thanks for identifying yourselves. And thank you for your years of service to Oakland Township. My opinion is that you do present some facts but not all the relevant facts. For example, with regard to Supervisor Gonser’s “preferential treatment of large landowners”, a missing key fact is that a large number of citizens had concerns about ordinances 16-2011A, 102 and 103 proposed in 2011. They expressed these concerns in Board of Trustee Meeting on 2/8/11, 3/8/11 and 3/22/11. These regulated such matters as noise, brush piles, unlicensed vehicles, etc. The large landowners felt these were very appropriate for subdivisions but unfair to them. For example prohibiting brush piles on large property would reduce wildlife habitat. Some legal opinions were that these ordinances might violate “Right to Farm” laws. The previous supervisor, Joan Fogler “tabled” these on 3/22/11 saying they needed to wait on the Goodison Plan, as it might require further zoning changes. On 7/22/11 Mr. Gonser suggested a citizen committee to work on these ordinances with township officials. This suggestion was not accepted as far as I can see in the record. There certainly are differences between subdivision lots and large acreage parcels. However, Supevisor Gonser’s use of the words “we do not want to infringe on the rights of really anyone, but PARTICULARLY those that live on acreage” indicates there is a preferential attitude that Supervisor Gonser has toward large land owners. You’re correct. It sure is nice to see the board meetings televised. There probably would have been a regime change many years earlier if they had been televised. Supervisor Gonser keeps saying that he had a private meeting with Former Township Superintendent Jim Creech in which Mr. Creech supposedly said “You run the meetings, I run the township” This is complete hearsay. Mr. Gonser and the tea party peanut gallery are reducing the pool of qualified Superintendent candidates at every BOT meeting with misinformation and hearsay. Remember the Township Attorney may think he works for the Board Members. However, as to our Attorney General he works for the Citizens in Oakland Trownships, who pays his exorbitant fees. He is there for the Money and has no loyality to the Citizens He works for other Townships in the area and his firm does not have all the answers much less him as the Township Attorney. Our attorney bills are out of control. The invoices need to be posted in the packets for ALL residents to see. It is OUR hundreds of thousands of dollars that are unprecedentedly being spent in such a frivolous manner! This will not stop until residents see exactly to WHO in the firm our money of 65 plus lawyers is going to and WHY!! The State of New York has officially banned fracking within its boundaries. Today’s finding statement has been in the works since December, when Martens said he would ban fracking because too little was known about the potential health impacts. Last month, the DEC released a 1,448-page report on fracking that began in 2009. Today’s findings statement is based on that report. I wish to thank you both so much for your time, professionalism, and high level of expertise devoted to this website!!!!! I love seeing people standing up and exposing darkness with the light of truth and facts. The truth will ALWAYS set you free! I have been a resident in Oakland Township (Goodison) for 43 years knowing we needed to vet our local ground level politicians, but not having an omnipotent source to do so——UNTIL NOW!!! Very smooth, user friendly, and heavily informative website. 7/30/16. Thank You. Thank you for your kind words. The past 3 years were nothing that Jim Foulkrod and I could have predicted. We never thought we would have seen the need to create this website. Both Jim and I had been involved in the Township for years. Jim as a ZBA member, Planning Commission member and Township Board Trustee. My involvement was as a Planning Commissioner for almost 27 years. We saw our Township grow and develop. What we were not prepared for was the Township leadership being taken over by someone who considered himself omnipotent, omniscient and was despotic. We were also not prepared for the unprofessional and unethical behavior of several on the Parks and Recreation Commission. When Terry Gonser became our Supervisor, we were all threatened. We had to do something to try to keep the citizens informed. We will find out on Tuesday whether we accomplished that goal. It is hard to believe how any person, who understand the things Gonser has done, would vote for him. Yet, we see many signs in our Township supporting Gonser. What has happened to this site? No updates in quite awhile. Is there nothing to watch in Oakland Township any more with Gonser gone?